Think about how much waste we create in our kitchens--plastic saran wrap, sandwich bags, paper napkins, food packaging-- the list goes on and on. The reality is, all that stuff we throw away in our kitchen ends up somewhere like taking up precious space in our landfills. While there are some people who are successful living a “Zero Waste” lifestyle, sometimes it’s hard to even know how to take a step in the right direction. The truth is a lot of the waste we create in the kitchen is avoidable! Check out the list below of sustainable kitchen supplies to reduce your family’s waste! Cutting down on waste and getting sustainable options into your kitchen is hard and honestly, overwhelming. Hopefully this series will help you take some simple steps in making smarter choices to reduce your carbon footprint in your kitchen! Do you have tips you’d like to share? 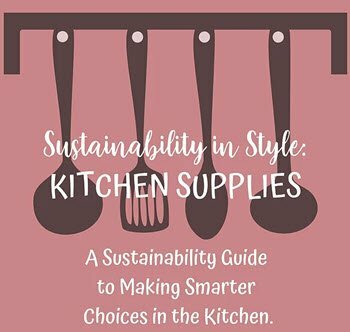 Let us know some of your favorite sustainable options for kitchen supplies in the comments below!